Here’s my hand drawn lettering illustration I recently did to help champion Nordic Bakery’s (deliciously sweet) Cinnamon Bun Week at the end of this month – starting from 28th of September to the 4th of October (actual, Cinnamon Bun Day), where the week will see Nordic featuring a different kind of cinnamon bun every day (yes, different flavours!). Which one will be your favourite? My illustration will be featured online to celebrate the cinnamon bun alongside some other fantastic local London Illustrators (including Emma Jayne @emma_j_designs, Carla Ferrari @cafiofepa & others). I enjoyed doing my digital illustrative piece and can’t wait to see the others collaborative pieces too. I hope you like my illustration and get the chance to check out the other illustrations on our interpretation of the ‘Cinnamon Bun’. Being a Yorkshire girl, I am definitely more of a tea drinker! 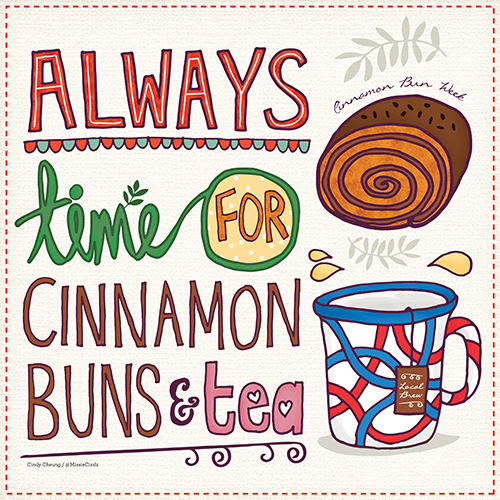 Cinnamon bun and tea: the perfect combo, indeed – YUM!